Green Tech students learn various computer science concepts including their correctness, resource consumption, and implementation (commonly referred to as coding) of algorithms in a target programming language..
Technology careers are in high demand as computer controlled automation systems help create clean energy solutions around the world. The Green Tech Web Builders Boot Camp is a 12-week intensive introduction to website development and computer coding. Green Tech offers a technical training course led by mechanical engineer, Alan Ware every week to students ages 12-19. 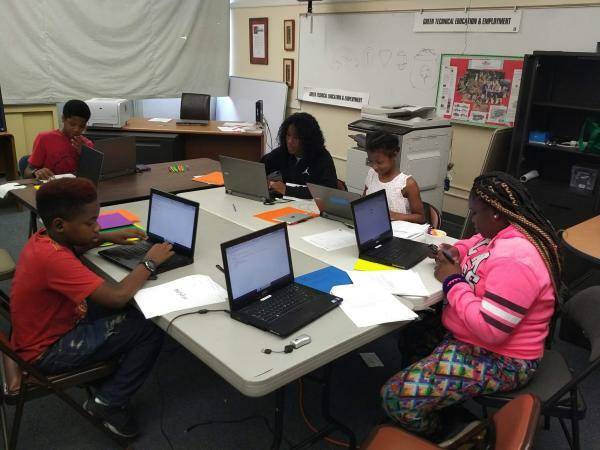 The boot camp teaches students how to build websites and use principals of marketing for small businesses to promote their products and services and effective digital media techniques. Each student is assigned a laptop computer. They learn the basic rules of coding, how to think in algorithims and given the confidence of developing computer programs. This innovative skill building training gives youth real world experience valuable to this generation. Our students learn how to use HTML and CSS to make webpages. HTML markup language surrounds content to tell browsers about headings, lists, tables, and more. CSS is the stylesheet language used to tell browsers to change the color, font, layout, and more.